Here is a book meant to be read deliberately so as to comprehend the significance and scope of its content. Universal and Accessible Design for Products, Services, and Processes by Robert F. Erlandson shares a design philosophy derived from a simple and fundamental premise: Good design works with, supports, and enhances human functioning; good design focuses on human strengths and not weaknesses. 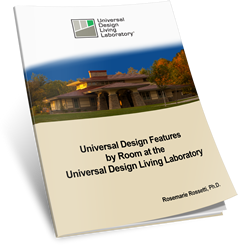 Universal design homes allow people to live more independently using technology. Home automation exemplifies the linkage between technological development and how society views people with disabilities. Devices such as garage door openers and programmable thermostats make life easier. As a result, individuals with disabilities whose homes are so equipped see themselves as able to function. Erlandson distinguishes between the underlying economic, political and social drivers for accessible and universal design. He sees that universal design is motivated by global competition. The creation of more universally accessible and usable products and services are being demanded by global markets. He also makes a point that universal design should be talked about when discussing sustainability. Erlandson makes a clear distinction between the terms accessible design, adaptable design, and universal design. Universal design is that which can be used and experienced by people of all abilities, to the greatest extent possible, without adaptations. Accessibility is an inherent part of universal design, but it may not, in itself, make for good design. It need only conform to the legally mandated requirements such as those in the Americans with Disabilities Act. The author makes a critical point to designers to move past simple compliance since these are minimum standards. He feels that accessible design creates a reactive mindset and that designers need to embrace universal design as a broader and more complementary approach to design. 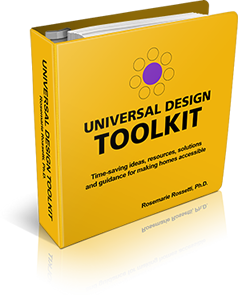 He recognizes that universal design traditionally focuses on creating nonstigmatizing, equitable designs. Universal design products and spaces are aesthetically pleasing, affordable and have a broader market appeal. This chapter on accessible design is a comprehensive review of major disability laws impacting the design of spaces, transportation systems, telecommunication products and services, and electronic and information technology. This chapter serves as a history of the Architectural Barriers Act of 1968; Americans with Disabilities Act in 1990 including Titles I-IV; Telecommunications Act of 1996; and Section 508 of the Rehabilitation Act Amendments of 1998. This chapter also informs the reader of the Access Board and its responsibilities. Erlandson presents through many of his chapters his eight principles of universal design to guide product and interior space designers. Great detail is provided on each of these design principles, including photographs of products highlighting features that make them more usable. I wanted to learn more after reading this book, so I contacted Erlandson to go beyond the book’s covers. He is a professor of Electrical and Computer Engineering and Biomedical Engineering at Wayne State University in Detroit, MI. His book is a collection of six years of information he acquired through research papers, articles, Web sites, and his classroom teaching experience. His motivation to write the book came from his insight about assistive technology at a rehabilitation hospital where he observed occupational therapists working with their patients. He wants to make the world a better place to live and help create environments where all people can have the opportunity to succeed and live productive lives. The primary audiences for this book include students and professionals in the fields of engineering, interior space and product design, physical and occupational therapy, and disability law. It will also serve as a great resource for those wanting to learn more about universal and accessible design. This 258 page, hardcover, book (ISBN 0-8493-7493-6) was released in 2008 by the CRC Press, Taylor & Francis Group. It is available for $89.95 through amazon.com as well as other online locations, or it can be ordered through most bookstores.